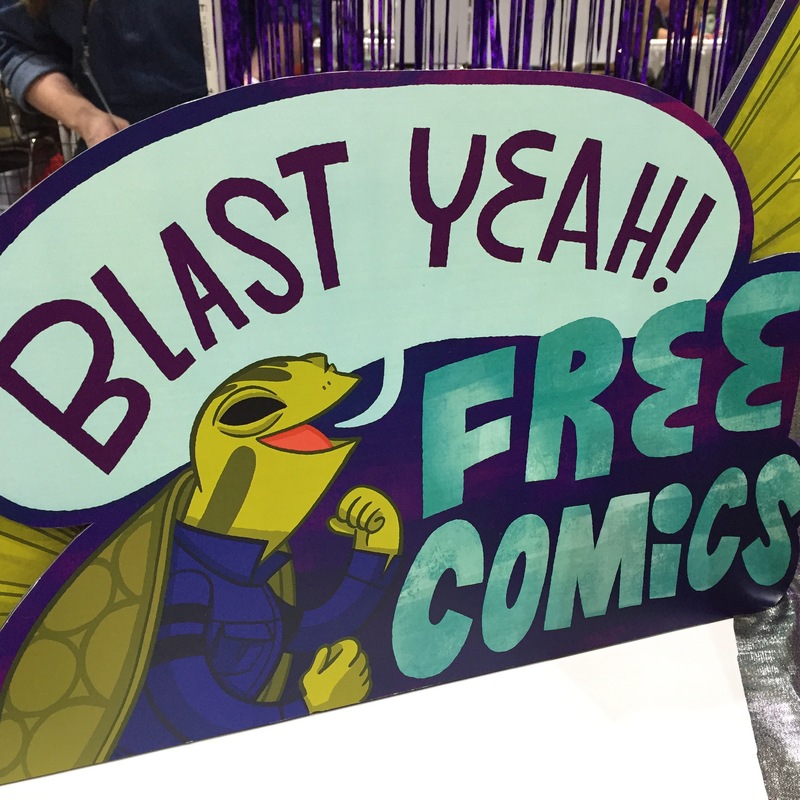 Star Beasts Land at Planet Comic Con! 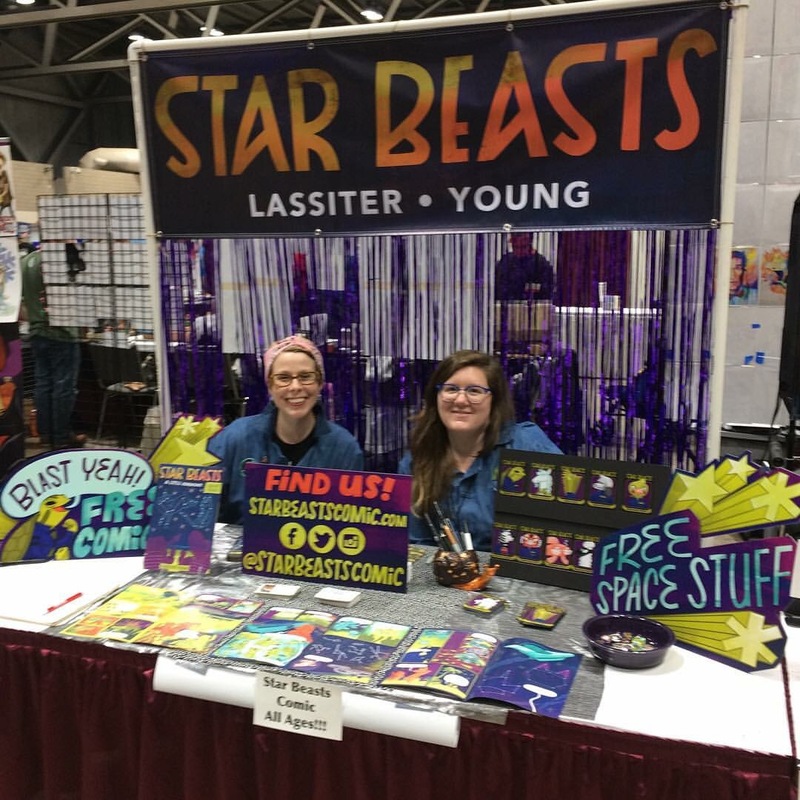 Yesterday we launched Star Beasts into the comic book atmosphere at Planet Comic Con KC! Come by and pick up a mini comic, button, trading cards, and PET SPACE ROCKS at Booth 426 if you’re in our orbit! When Lassie and I decided to make Star Beasts, I’d never written a comic before. BAM! This newbie had to figure how to write comics fast, but let’s face it– ideas need to be born. After I dreamed up a new pet space world, developed characters with Lassie, plotted, paced, and read bunch of comic writer scripts, I was ready to finally start writing. My game plan was to write 6 issues at once and capture the whole story arc. To keep track of my page spreads, I drew mini storyboards of the 24 page comic on a piece of notebook paper. I numbered each square so I could see the spreads at a glance. Then I tore up sticky notes into 24 pieces. On each one, I scribbled down the main plot point for each page. This helped me keep track of the story flow, especially if I needed to make pancakes, or something before I finished writing the issue. PLUS! I could just take the sticky notes off and use the same base notebook storyboard for the next issue. Very handy-dandy. I did this process for all six issues and it worked super well. Try it out! There are four key natural Zoorb sources of power for all creatures on Earth: Air, Dark, Drink, and Dirt. Some ancient creatures have developed additional magical abilities that reflect their Zoorb sources of power. Air: Creatures that refuge in the sky like birds. They have the ability to twist and control air. Dark: Creatures that take refuge in the dark places like serpents and insects. They have the ability to disorient and extinguish light. Drink: Creatures that take refuge in water like fish and water monsters. They have the ability to control water. Dirt: Creatures that take refuge on land like mammals and humanoids. They have the ability to create small earthquakes. Before making the art for the actual story, the first step to drawing comics is figuring out what everything looks like! It’s a long, time-consuming task – especially when there are so many characters playing important parts in your story. But you’ll thank yourself later, when you have such a nice piece of reference to look at! Now, when it’s time to draw the part of the story where Pep ::: SPOILER EDIT :::: or when he :::: SPOILER EDIT ::::, or the time when he :::: SPOILER EDIT ::::, I won’t have to spend time wondering, “hmm… how many rings does he have on his tail?” or “Does Pep tuck in his uniform like the sharp young iguana that his mama taught him to be?” All I have to do is take a look at the handy character sheet I made for him! Pep is a young iguana and a recent stowaway on the Condor. Captain Bandit quickly recognized his crazy natural techie abilities and rushed his paperwork through the Zoorb Academy. This meant Pep skipped school and went straight to space, a fact that doesn’t sit well with some of the Condor CrewCreatures. As Tech Maintenance Support, Pep knows his job is crucial, BUT it also keeps him stuck on the Condor. Pep craves adventure. He loves to be in the thick of things. So far, Pep’s always been left behind to fix on tech issues while the rest of the crew goes on wild missions to save the universe. While he waits for his first big mission, Pep collects postcards from the places the Condor visits. He plans on sending one of them to his parents to tell them he’s okay. Stowing away on the ship was sort of a spontaneous decision. His parents think he’s still on Spring Break in Florida.